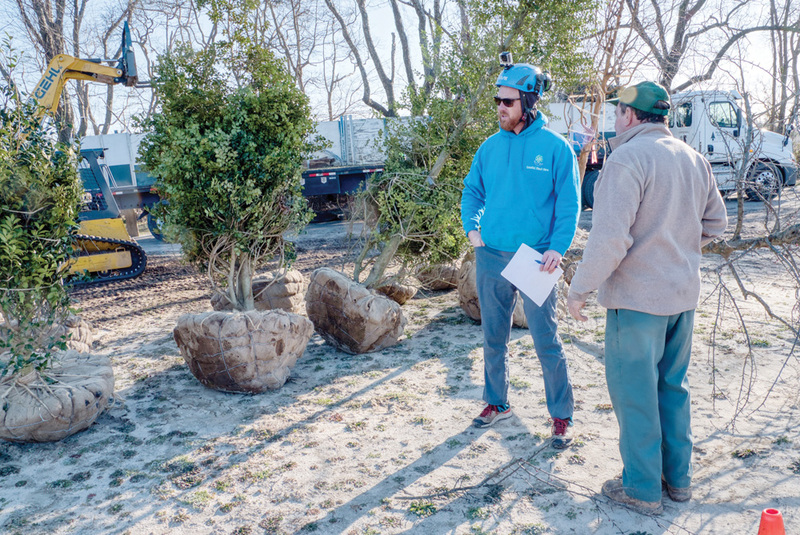 Jeremy Hager, ISA board-certified Master Arborist, and Randy Childress of Delta Nursery discuss holly tree placement at DBG. Bottom, DBG Volunteer Coordinator Carol McCloud waters the newly arrived Anderson holly trees. 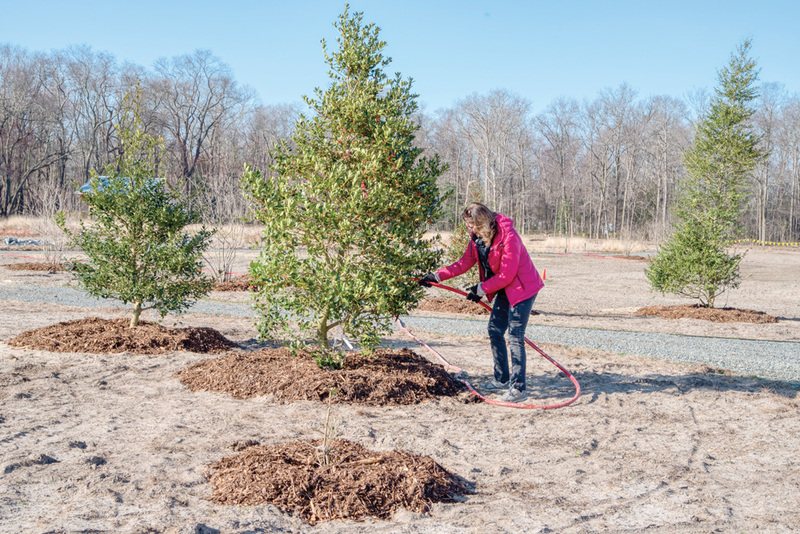 On March 27, the Delaware Botanic Gardens (DBG) received and planted 32 American holly trees that were donated from the Charles R. Anderson Holly Collection in Owings Mills, Md. DBG volunteers, staff and contractors led by Jeremy Hager, ISA board-certified Master Arborist at Coastal Plant Care, supervised the planting. Hager, a DBG Board member, said, “The Anderson collection consists of over 120 different cultivars of llex. DBG choose 36 unique hollies from the collection to come to Delaware, which represents over a quarter of Mr. Anderson’s total collection of various holly varieties. The importance of the collection is allowing visitors to view deciduous and evergreen hollies rarely seen. Hollies ranging in height from 1 to 15 feet and in tree and shrub form now reside at DBG. The mission of the Delaware Botanic Gardens is “to create an inspirational, educational, and sustainable public garden in Delaware for the benefit and enjoyment of all. The Delaware Botanic Gardens celebrates the coastal plain with a sustainable garden that delights and educates visitors and inspires them to preserve Delmarva’s native landscape.” For further information on the Delaware Botanic Gardens, go to www.delawaregardens.org.